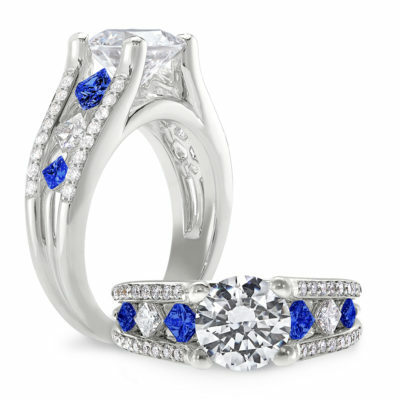 Sleek modern styling featuring blue sapphire and diamond princess cut diamonds set point to point, highlighted by your skin peaking through the diamonds. Two soft rows of diamonds hold the princess cuts. Soft round wire contrasts with diamonds set between two rows of yellow diamon3rd tierds. 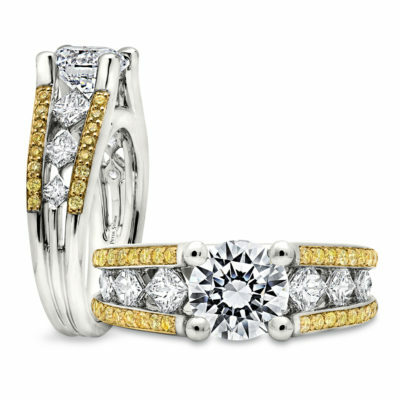 The ring features fancy intense natural yellow round diamonds that highlight the princess cut diamonds that float above your finger.